Innovation usually starts with a problem, and on the family farm, equipment repairs are a daily and expensive occurrence. Last fall, Farm Industry News published an article entitled, Impact on Agriculture, detailing how 3D printers can quickly and cost effectively print needed combine parts including augers and corn snouts. 3D printers are now used to manufacture prosthetics. Last month, engineering students from the University of Toronto designed and built a 3D printer that produces skin grafts using the patients own cells. 3D printing is changing industry and business as it transforms the areas of repair, prototyping, and niche item production. With the price of a printer becoming more affordable, it is now possible to introduce this technology to our students. 3D printing provide students with a new type of manipulative for use in almost any class; one that allows them to move between the abstract and concrete by designing and creating. Printers can now be purchased for anywhere between $500 – $2500, and the options continue to expand as more companies move into the business. 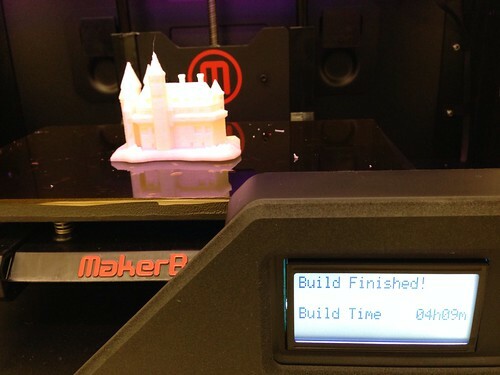 We have a Makerbot Replicator 2X which was purchased through Sculpture Supply in Toronto. A 3D printer builds solid, three-dimensional objects out of a coil of melted filament. After students design an object using one of the various free software options, the 3D design files are translated into instructions using Makerbot desktop software and sent to the machine via USB or SD Card. Filament, which comes in various materials, runs up the back of the machine into the extruders. The filament is fed into the extruder, heated to 230 C and laid down in layers to slowly build a solid object layer by layer from the bottom up. It’s a process similar to a mig welder or a tiny hot glue gun. The display on the machine lets you know how far along the build is, in terms of time and percent of build. In our relatively young teaching careers, we have noticed that our students come alive whenever they are presented with an opportunity to make something out of nothing. They are, as Chris Anderson quipped, “…born makers”, whether they cook, sew, or take photos. When asked on the year-end surveys, our students tell us time and time again that their favourite activities of their grade 8 year were making gingerbread cookies at Christmas, building catapults in the wood shop and creating layered jello models of cells. The education system of the past had students going to school for twenty-plus years to “Learn” a particular skill-set tied to one career (engineer, chef, lawyer). When their school careers were over, they went to work to “Do” – to practice what they had learned in preparation for their career. However, the problems we now face in the 21st century and beyond, require skills and a mindset that vastly differ from before. Our population of over billion requires us to create new food systems; global warming is forcing us to think about how coastlines will be saved. The world that our graduates are entering requires them to have experienced a new kind of learning, an education in which learning is married with innovation. We need graduates who know how to do more than memorize facts. They need to learn how to discover – to think beyond what has been impossible in the past. But how is this learning achieved? We’ve discovered, first-hand that “kids have always made things, technology has the potential to supercharge learning.” And so our foray into 3D Printing began. We began to witness successes as soon as the box was opened. First and foremost, teachers are no longer purveyors of knowledge. We knew NOTHING about how to set up a 3D printer – we plunged head first, figuratively and literally into the box and started to set it up. Three of our students took the lead from the very first day. They helped unpack the printer, found a Youtube video with setup instructions and helped us solve the plethora of technical issues we’ve had since. Students took the lead in sharing their new knowledge with the many others within our school and the greater district. Our policy from the beginning has been accessible for many, not a few. As a 7-12 school, there have been numerous others have utilized the printer for various projects. Within the first 7 months of having it running, over 200 students in elementary and high school grades have used the 3D printer. A favourite education quote comes from W.B. Yeates, when he argued that, “Education is not the filling of a pail, but the lighting of a fire.” Our students know that the 3D printer is capable of printing toys such as model Minions from Despicable Me or Super Mario, or key chains. We wanted them to understand that 3D printing technology is transforming the world – but not in 10 years – in the here and now. We needed to ignite a fire of curiosity in our students. To this end, the match and tinder came in the form of a presentation that challenged the students to research and present a real-world application of 3D printing to their peers. We asked them to find an online article/video that described the “5W’s/How and Who” benefits of 3D printing technology. Our students found articles ranging from 3D printed orthotics which are a fraction of the cost of traditional orthotics, 3D printed drones being used in the military, and 3D printed columns that can withstand earthquakes. As student and teacher learning developed, so did our fluency in new vocabulary. Words and phrases such as “filament, build plate, stl files” frequently filtered into student discussions. Students continued to suggest words that needed to be added to our growing list as they took ownership of their learning. They are very respectful of the cost associated with printing, and so they weighed and determined the price of several items based on a filament cost of $53/kg. This exercise tied in directly with their current math unit on rate and ratio. The cost to print most of their pieces ranged from 50 cents to just over $1. The time required to print each item they design is determined not only by the size but by the resolution, or quality of the print, which can adjusted. On their own initiative, students decided to compare the quality and time of a detailed castle in high, medium and low resolution. Determining the cost and time required are important steps in the students’ introduction to 3D printing, particularly if you have a large number of students using the printer as the printer will be running throughout the day. Students begin the process by designing an item using one of the various free software options before moving to the print stage. For those students who were choosing to spend their lunch hour in the classroom, we suggested they first play with Sketchup and AutoDesk 123D Design. We had no experience with either, but had read both were good options. These students quickly picked up how to use these programs, and willingly agreed to introduce Sketchup to 60 of their peers. For us, the most exciting piece of this experience is watching who becomes the “teachers”. We often see those “C” students who fly under the radar in the regular classroom, becoming the class experts as they reveal their love of learning in this context. As with any new undertaking, students had a lot of questions. Who better to turn to than other students? Students from Donview Middle School skyped in from their wood shop class and shared their experiences with Sketchup and 123D Design. As part of our gr. 8 science unit, students had built catapults in the high school wood shop. But these catapults were all identical. Now that the students were familiar the design software, they were challenged to apply what they had learned in their Mechanical Systems unit, and improve on the design, adding a part created on the 3D printer. No 3D Printer? No Problem..
Andrea Yantzi, a grade four/five teacher from a distant school, Sprucedale Public School, met with us in order to learn about the printer and software. Back in her classroom, Andrea introduced her students to one of the simpler software options, Tinkercad, and they applied what they had learned in their science unit on Bridges as they designed their own bridge. Andrea emailed the files to us, we printed off the students’ work, and sent their bridges, some with the student’s name on them as they had designed, back to her class. This is a similar communication process used to manufacture 3D objects on the International Space Station. You can learn more about that process on the website, Made in Space. Thomas Pritchard, a CHSS student, took part this summer in SHAD – an engineering camp: his team developed a product called Evita to get rid of phantom power loads (a toaster, though not in use but still plugged in, is still drawing a tiny amount of power from the grid). This device will automatically disconnect that toaster from the grid and relieve phantom power loads. Through a family friend, he contacted us this past August, and came in to print his prototype on the printer. Last month, Thomas’ team won several awards at the national competition including second place out of 15 projects from across the country for the prototype, first for their applications of scientific principles, and best overall out of all the projects, tied with University of New Brunswick. While we hoped that the process of implementing the 3D printer in our classrooms would be stress-free, this has not been the case. Unlike computers, there are no 3D printer technicians employed by our school board. Who was going to fix it if we broke something? With a “we can handle anything” mindset, we plunged headlong into our new reality. There have been many valleys, storms and pitfalls along the way, though we are slowly moving upwards. For example, we were shipped the wrong type of filament, and it took two painstaking weeks to problem solve the issue. Since we’re running BETA-based 3D design software (123D Design), our students are experiencing frustrating glitches and unexpected freezing mid-way through their design process. It forces students to be constantly saving their work to make sure it doesn’t get lost. Our most recent activity with our grade 8 students is the City X Project which is an initiative of IDEAco (The Coalition for Innovative Development, Education and Action), a nonprofit organization. IDEAco’s mission is to build and empower communities of Changemakers around the world. City X Project introduces students to the 6 step design process, the same process the 21st world that the students will graduate into, will demand they follow. It helps students understand a challenge and the people it affects, generate possible solutions, develop a final product, and then share with the world. The students are assigned a real world problem in the context of a story with elements of gaming. We walked our students through the process of invention through which they learn the value of empathy, understanding the people who are facing the challenge and the larger social issue to which their assigned problem relates such as healthcare, education, or food among others. Once students have generated multiple ideas for solving the problem, they build a quick prototype based on their preferred idea. In the test phase, students share their ideas with a partner. They learn that testing reveals what works, what doesn’t work, and how a prototype can be improved. As they move onto building their final prototype, students experience the relationship between failure and the overall success of an invention. Once the final prototype has been created, students were introduced to the 3D software. This year, we decided to stay away from online programs like Tinkercad due to wifi issues we had last year when using the program, and start with Autodesk 123D Design, downloaded onto the laptops. Riley and Jake, who taught the class Sketchup last year, were more than happy to be back in their old gr. 8 classroom, firing up the printer and putting together a plan for teaching over 70 students. They spent half a day with our students, teaching them the basics of 123d Design and how to create a simple object. During that time, we quickly saw their successors emerging as they grasped the program and began to help their peers. You know the student is engaged and proud of their work when they capture images of their designs. Now the students were ready to design their clay prototype on the 3D printer. On day 5, students brought their final prototype alive on the screen. Excitement built as they saw their design move from abstract to concrete as it was printed. The final step involves students sharing their designs in the City X Project online community found at 123dapp.com/gallery or tinkercad.com/things. Use Cityx as the search query. Many of these inventions are tagged with the global cities of the students who make them, and students will be able to learn how others around the world solved the same problem. What Will Our Students Remember About School? 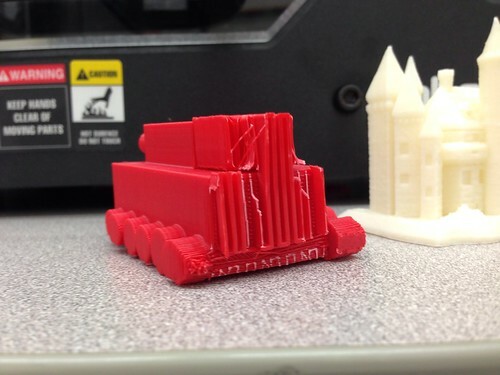 Learning about 3D printing with our students means we don’t always have the answer. We have decided to remove ourselves from the front of the class to sitting in a desk beside our students, becoming co-learners. In doing so, we work to create an environment in which any problem is solvable. Our students tinker, make, build, test, and refine. These are skills that will assist our students solve any problem they might face in their futures. The introduction of this technology into the classroom has the opportunity to take teacher and students into never-before-dreamed of heights. To be sure, technology should not and cannot replace tried and tested sound teaching practices. There are those who might wonder, “where is the curriculum in all of this 3D designing?” We have gone to great lengths to ensure that our projects are tied directly to the curriculum. Our students are still reading and writing, learning about the roles and function of the organelles in cells in Science, and about settlement patterns in Geography. However, we strongly believe that the 3D printer has the capacity to take us to a new level of thinking with our students. It’s the getting out of the desk and getting our hands dirty that we remember from our student days. We hope that through the use of the 3D printer, we are able to offer a program that is innovative, preparing our students to solve real problems with never-before thought of innovations. 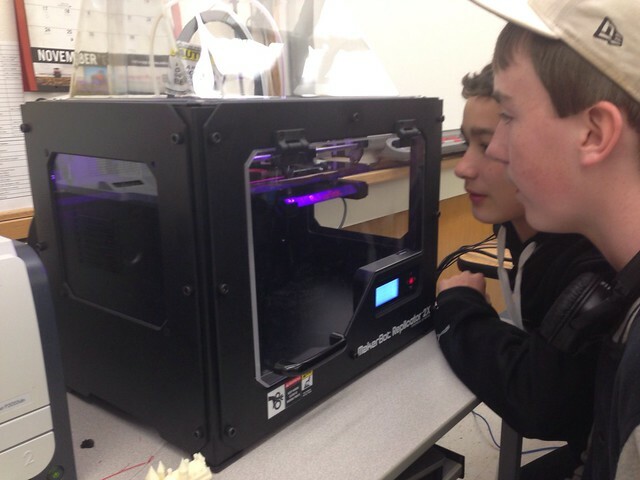 The Makerbot 2X Replicator 3D printer has brought some exciting, vigorous learning into my grade 8 classroom. My room is full at lunchtime and after school with kids experimenting and curious teachers and students observing. On a couple of occasions, I’ve even had to kick a few students out after 5 p.m. I had no prior experience with these printers. While fascinated with the articles I’d read showing how they are used in meaningful ways, I had never seen one up close until ours arrived in my classroom. In a previous post, I wrote about how students dove in, setting it up. We’ve had the printer now for eight days. In this post I’ll share what the students and I have learned together. When the tech department teachers paid a visit to our room, these 13 and 14 yr. old. “geniuses” explained how the machine worked, its maintenance requirements, cost and time of production for each model, their newly acquired vocabulary and their next steps. Makerbot has an excellent site complete with instructional videos and an expanding page offering uses in education. Last week, when we were struggling with the Makerware download, I submitted a support ticket. 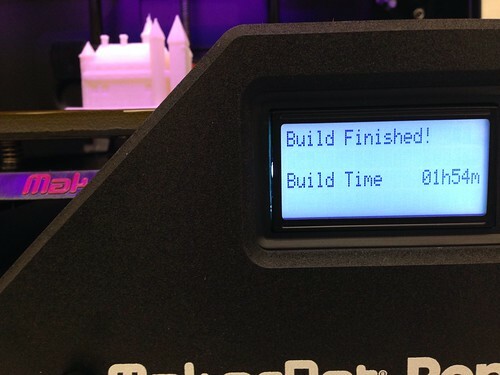 The Makerbot support team was responsive and within a few days, and the software fixed, we had the program loaded onto all laptops and netbooks. 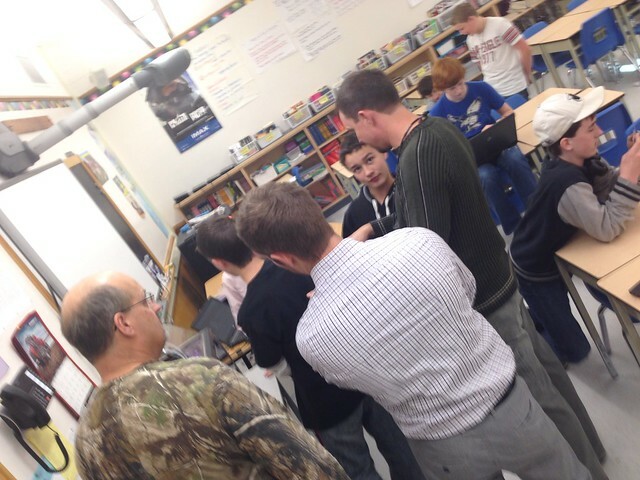 In order for students to understand what a 3D printer could produce, we spent a class period touring thingiverse. This is a design community where students can discover what others have created, and because designs are licensed under Creative Commons, anyone can use these. The students learned how to download and print a few items from thingiverse – guitar picks, hockey stick and puck. Students are very respectful and conscious of the cost associated with printing, and so they weighed and determined the cost of each item based on a filament cost of $58/kg. 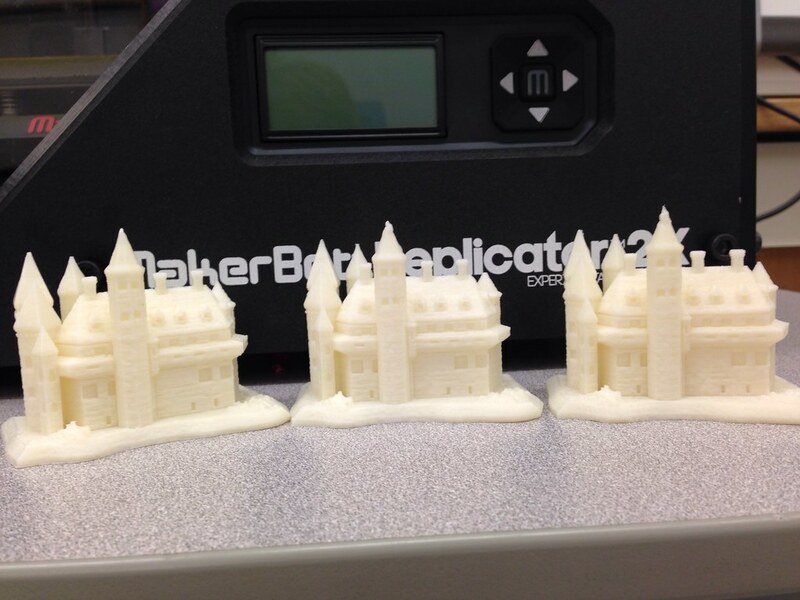 The time to print each item is determined not only by the size but by the resolution, so they decided to compare the quality and time of a detailed castle in high, medium and low resolution. My next door teaching partner, Marc Westra, and I wanted students to understand that 3-D printers aren’t a fad, just used to manufacture toys. They offer benefits to society that most of us haven’t even imaged. As part of a reading activity, students explored Facebook, Twitter, Instagram and sites such as 3DPrinterworld.com to discover a multitude of uses. This week as more students chose to spend their lunch hour in my classroom, I suggested the kids play with two design software programs, Sketchup and Auto123D (I had no experience with either). They picked up Sketchup very quickly. 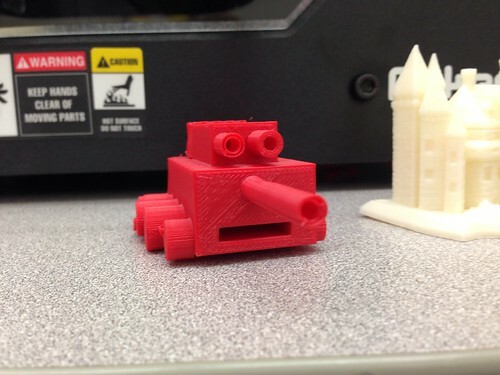 One student designed an army tank, then the group worked together to determine how to export the file into Makerware and print (export, save as .OBJ file). Once in Makerware, the students decided they needed to add supports for the overhanging parts of the tank which are removed after printing. All of this was happening while I was learning how to use Auto123D from Riley, another gr. 8 student. During the next class that followed lunch, while I was teaching Language, the printer softly sang out its robotic song of beeps and bells as it churned out “Joey the Tank”. Yes, there were some mistakes (yeah!) which they’ll solve and reprint. Still, the students were pretty proud of themselves after creating and printing the first original 3D model at Madill. Skills used: collaboration, critical thinking, creativity, communication and problem solving. 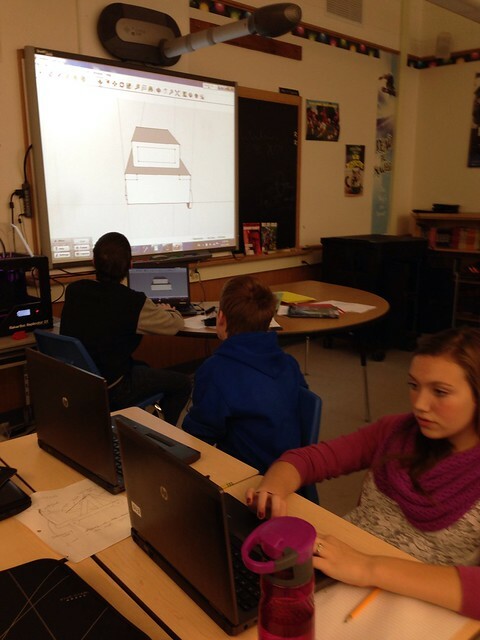 In the following class, I had these students introduce Sketchup to 60 of their peers. They’ve written an extension by creating a model for the students to produce in the next lesson. For me, the most important piece of this experience is recognizing who these “teachers” are. A few are those “C” students who fly under the radar in the regular classroom. Now, they have moved from learner to teacher. Some students prefer Auto123D as the design software. Using the app 123D Catch, they discovered how to turn photos into a 3D models of themselves. Their goal is to create their entire class in 3D. Other designers/entrepreneurs in class want to design and sell (as a Gr. 8 fundraiser) FE Madill “stuff” – iphone cases with the student’s name embossed, guitar picks, and more. Their list is growing and will lead to another branch of learning including marketing and economics. Success comes in many forms and pathways. Providing opportunities for students to explore areas of their interests strengthens our connections with them. While there may be no direct mention of computer design structure in the Gr. 8 curriculum, the critical thinking skills they are developing as they collaborate and share is enriching their self-directed learning. It’s fascinating to experience. I’m looking forward to seeing how students and other teachers in our school use this 3D technology.